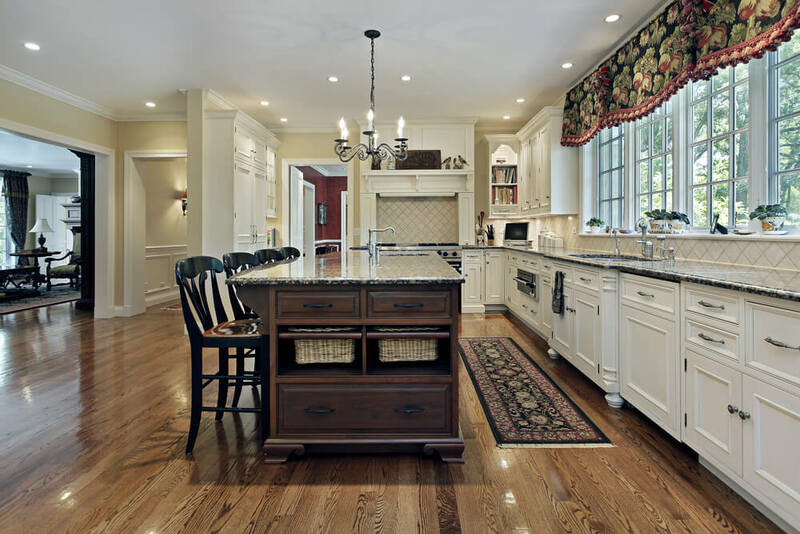 See our gallery of kitchens with large and small Islands. 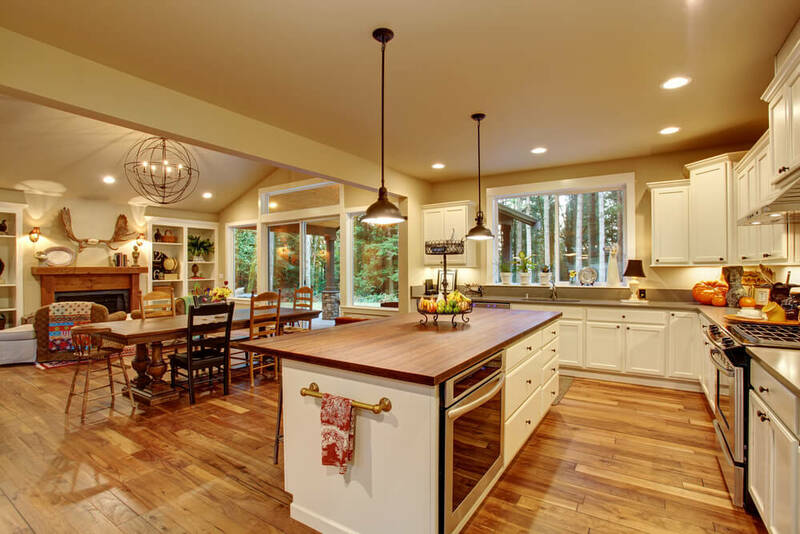 From beautiful to bold, see design Ideas for your home and build the kitchen of your dreams. While it may be hard to hear, your kitchen may be too small for an island. Take careful measurements to determine if you have enough square footage available. 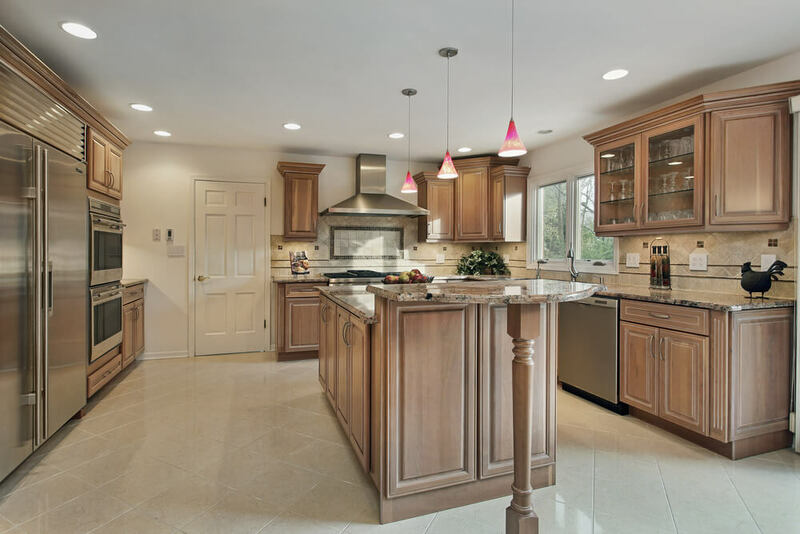 Ideally, there should be at least 3 and up to 6 feet between your island and the surrounding cabinetry. 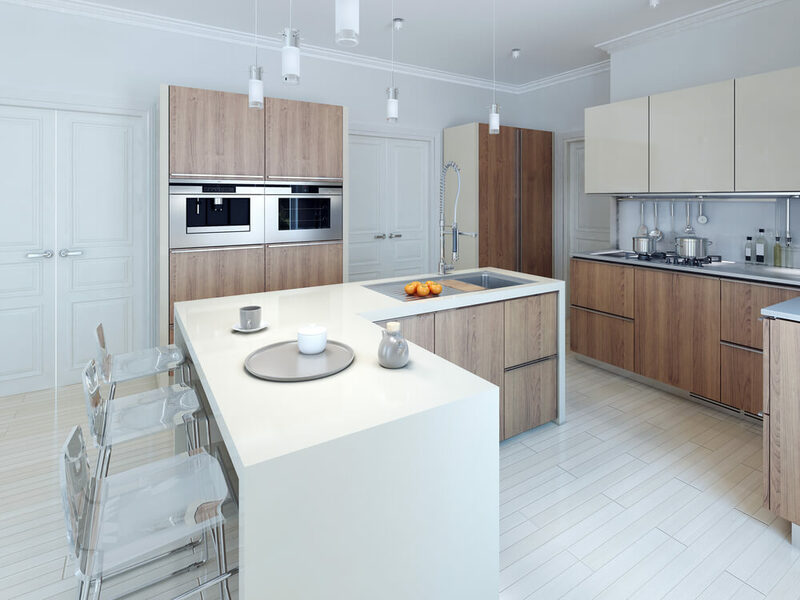 Anything smaller than 3 feet will require a series of difficult maneuvers to access items in your base cabinetry or to take items out of the oven. This lack of maneuverability is not worth having an island. The size of an island will affect its cost. 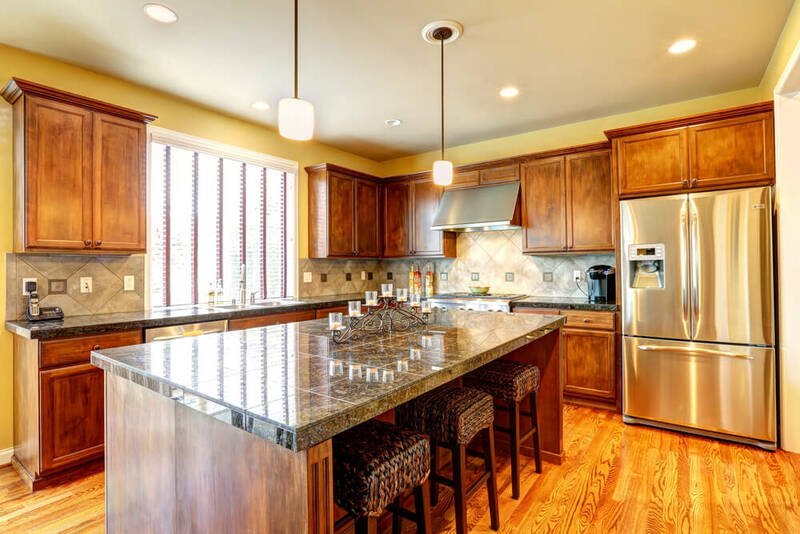 Naturally, the more material needed, the larger the slab of granite, the higher the price tag. Keep these things in mind when making plans for your kitchen. In addition, moving your appliances and additional hook-ups to the island will cost more. If you wish to save on these expenses, consider leaving your existing appliances in their current locations. In addition, the cost will vary depending on the type of materials to be used. 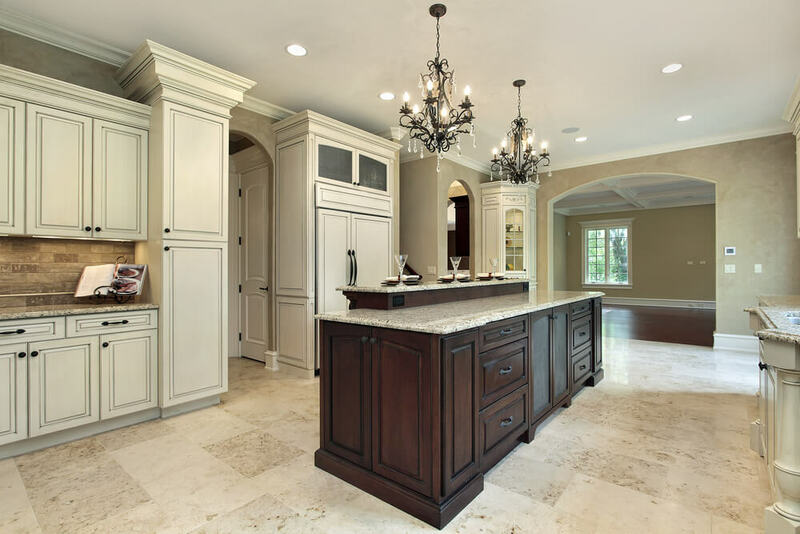 Granite, quartz and marble can be significantly more expensive than laminate. 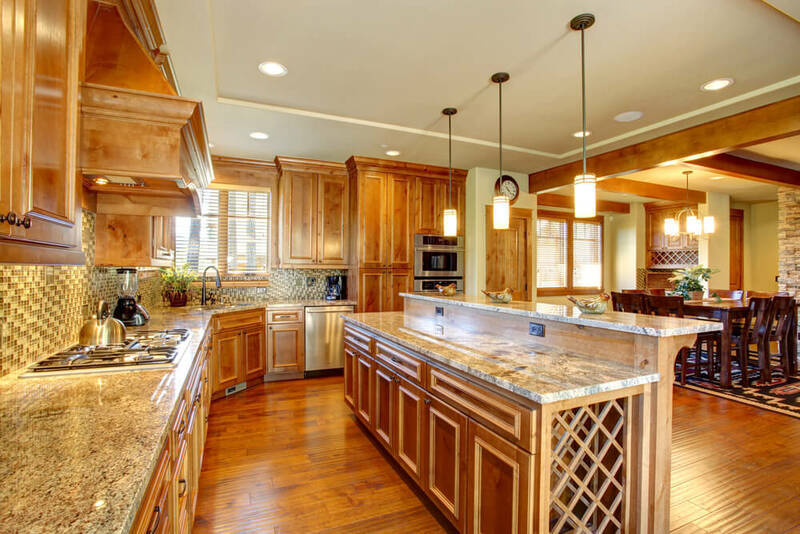 Details such as custom corbels and other woodwork will also increase the island’s price tag. A trick to reducing the cost is to retrofit an existing table, dresser, cart, etc. to be used as an island. 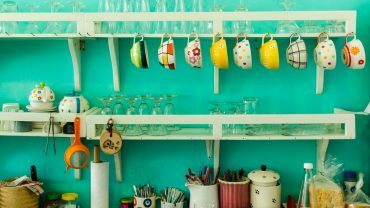 This approach will save you some cash and add an eclectic vibe to your kitchen. 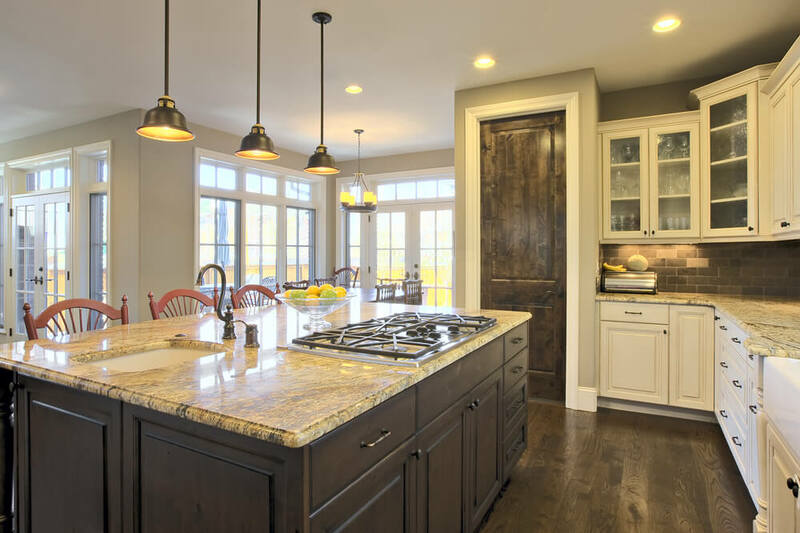 Most islands are designed to coordinate with the surrounding cabinetry while offering a variation in style, color or a combination of the two. For example, a dark grey island in an all-white kitchen can create a natural focal point for the space and a touch of drama. Additionally, butcher block countertop on the island can provide a subtle contrast to the marble countertops in the rest of the kitchen. The design of an island will be determined by its intended use. Consider how you will use this additional piece of furniture in your kitchen. A kitchen island can be used for activities: homework, buffet, food preparation and clean-up and as the family dinner table. Therefore you may need to incorporate a sink or cooktop, a breakfast bar, or an area to seat up to 6 people. 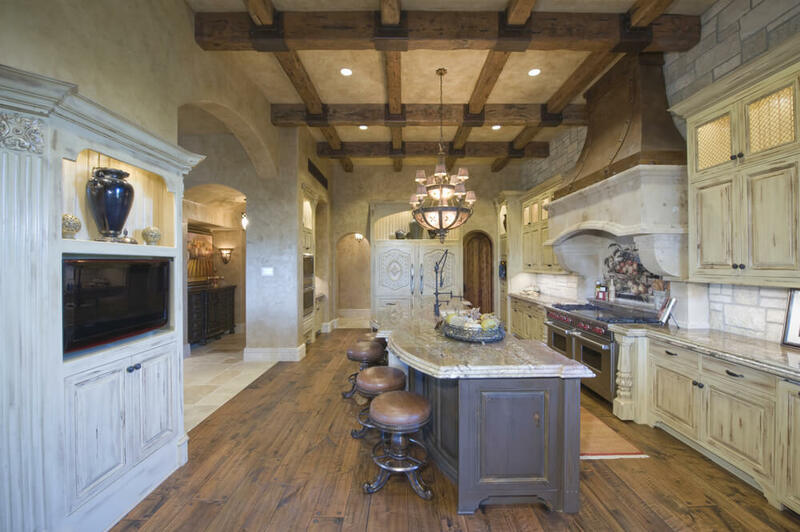 Check out our gallery below view a variety of kitchen islands for ideas and inspiration. Choose your favorite characteristics and materials to create incorporate into your space. 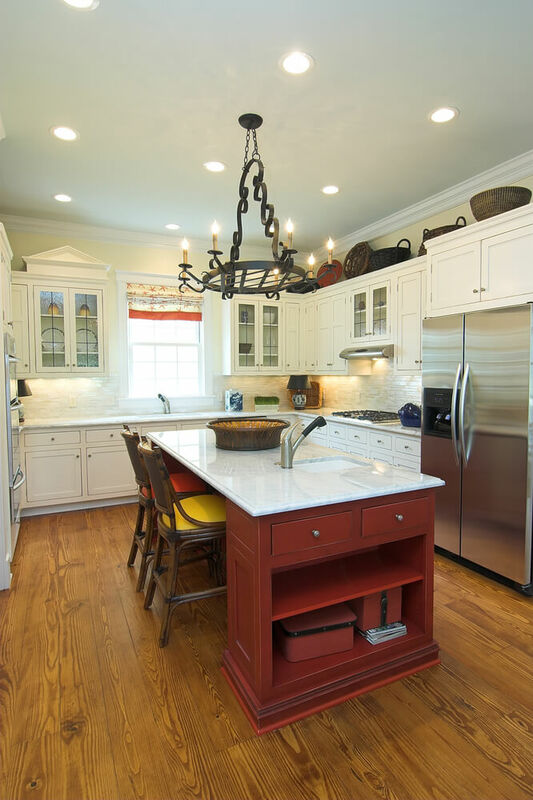 This stained-wood island stands out among the white cabinetry surrounding it. 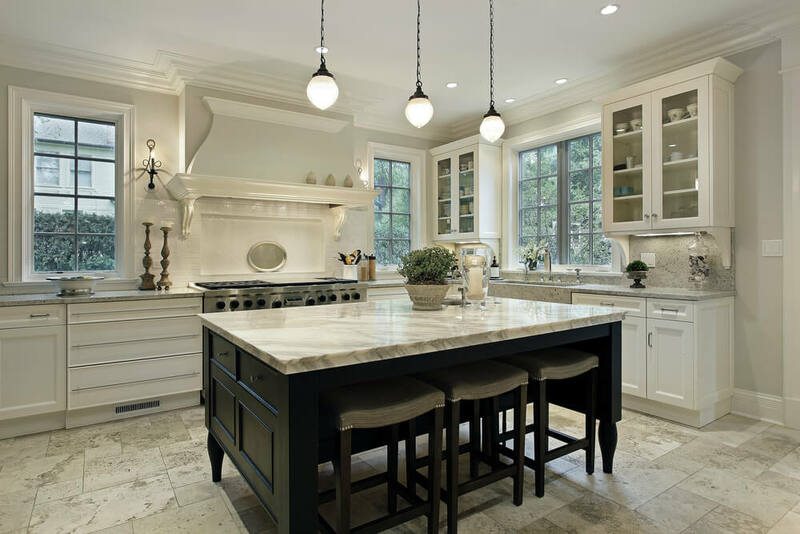 A large slab of Carrara marble provides the ideal surface for food preparation and cleanup. 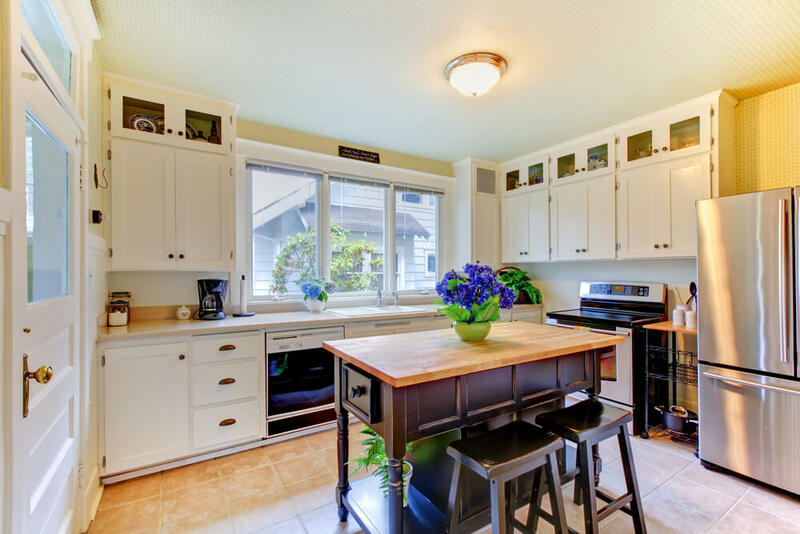 This spacious kitchen features two islands, both features sinks for food preparation and cleanup. The second island also includes a niche for a pet’s food bowls. 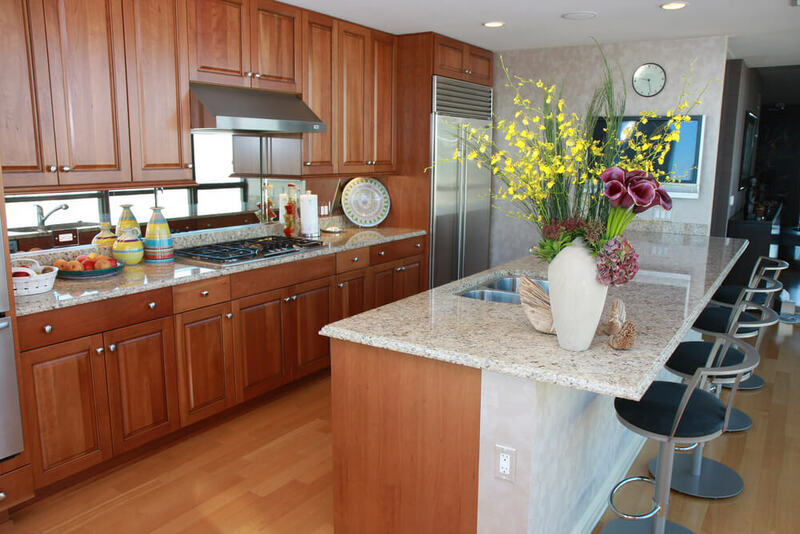 This long galley kitchen features a full-length island. 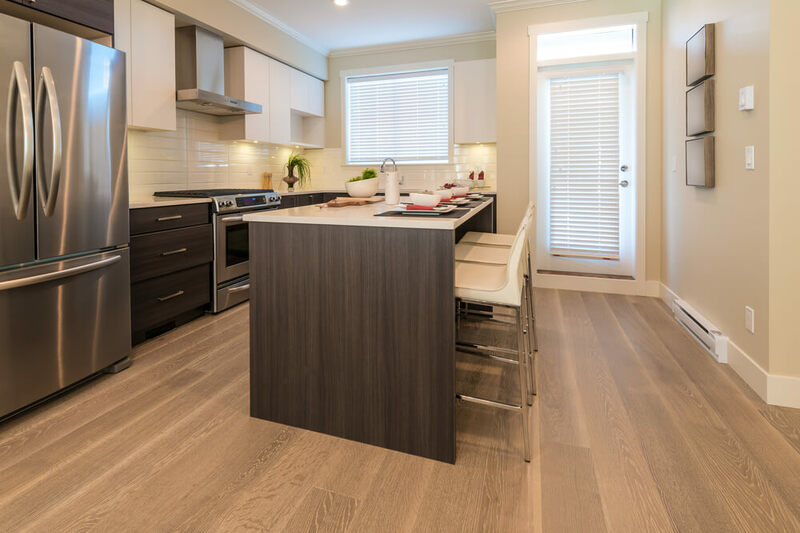 The island is designed in the style of the kitchen with modern cabinetry and flat bar pulls. This island’s bi-level design provides space for food preparation and clean up while also accommodating a spacious breakfast bar. Decorative wooden legs and custom corbels add ornamental detail. 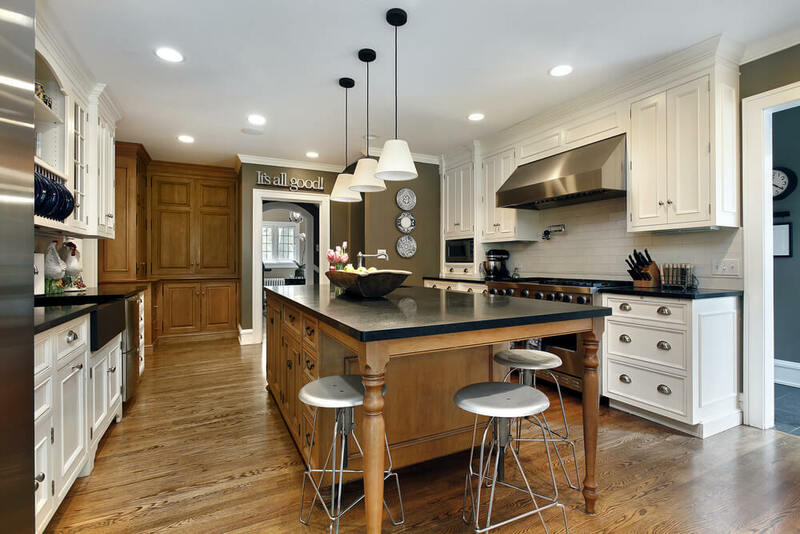 This island features Shaker-style cabinetry and matte black bin pulls and knobs. The wood countertop is one of the many features that make this a country kitchen. 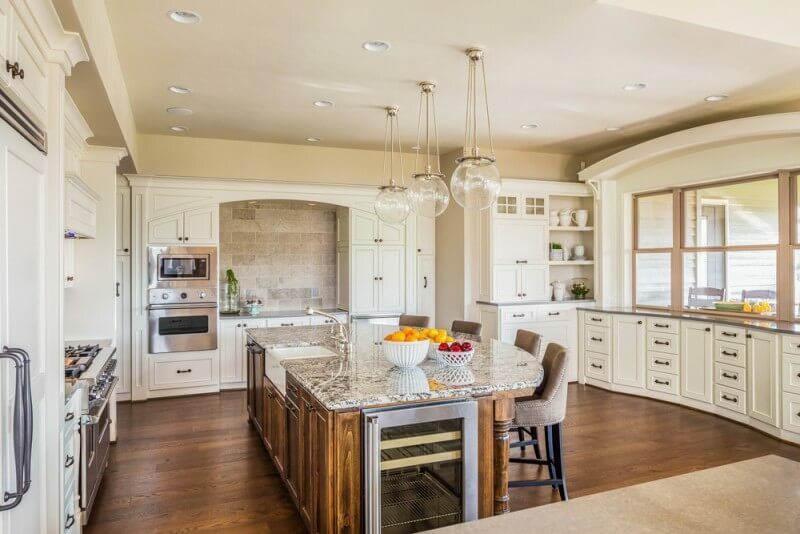 This expansive kitchen island is designed for storage on one end and acts as a breakfast bar on the other. The breakfast bar is designed to seat five comfortably. This modern island features an integrated wood and stainless steel countertop. The stainless steel portion makes kitchen mess easy to clean up. 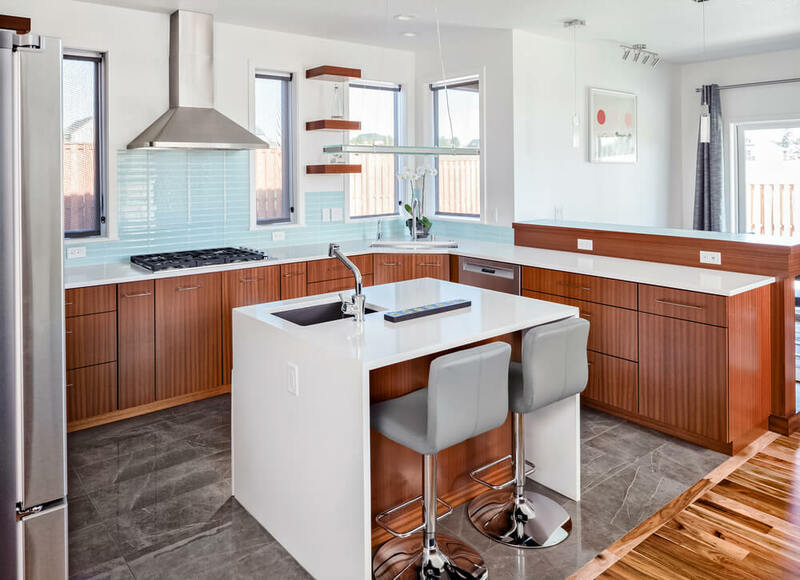 This modern kitchen features a peninsula and an island. The island is designed in the same fashion as the kitchen cabinets and features an additional sink and sleek, quartz countertop. This kitchen island adds a pop of color to this country kitchen. The deep red color of the island cabinetry contrasts beautifully with the Carrara marble countertop. This island includes the main kitchen sink, as well as a breakfast bar with seating for four people. Integrated plug-ins ensure that the island is convenient to use for all kitchen functions. 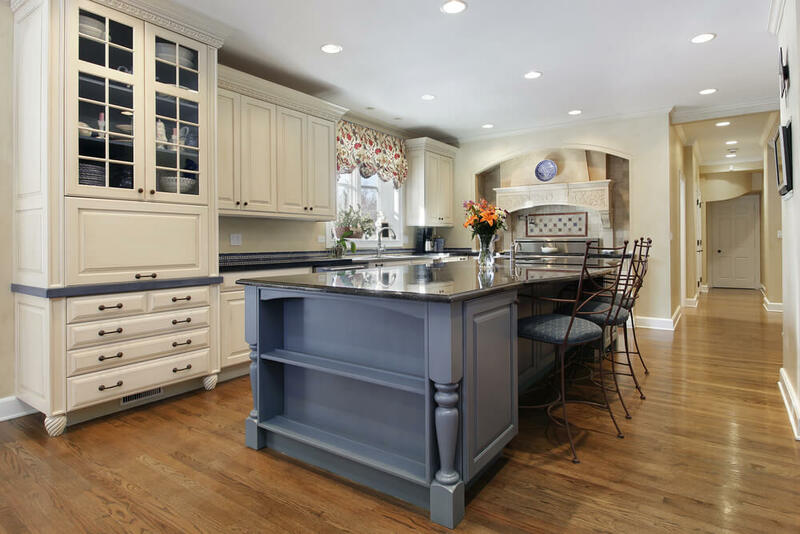 With its dimensions and light blue paint job, this island is a beautiful addition to this elegant kitchen. The color of the island coordinates perfectly with the countertop and neutral color scheme throughout the kitchen. 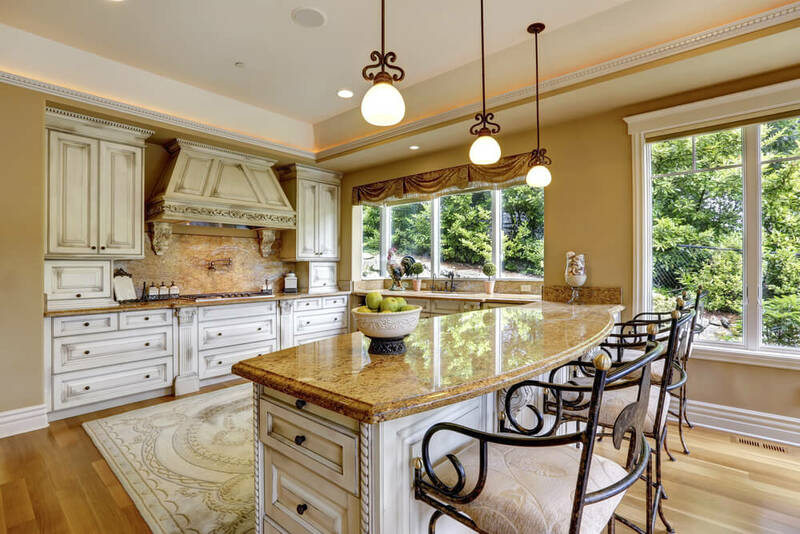 This island features a bi-level design, built-in sink and embellished corbels that coordinate beautifully with the traditional elegance of this large kitchen. 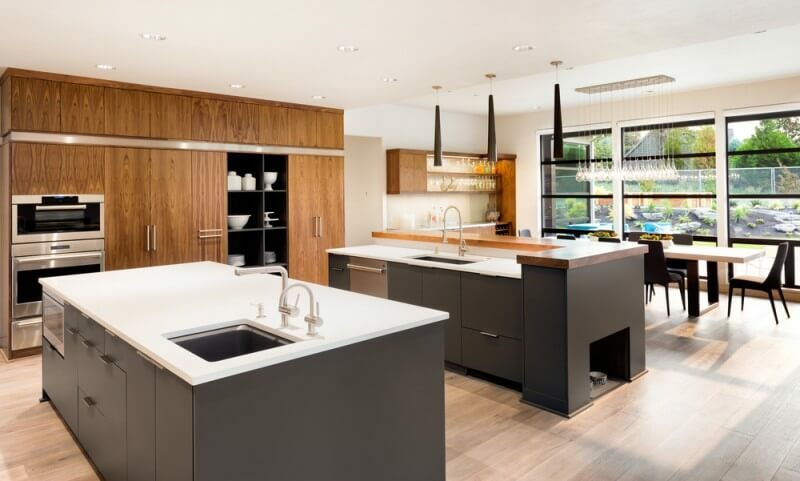 This modern kitchen space features a large rectangular island with an undermount sink. 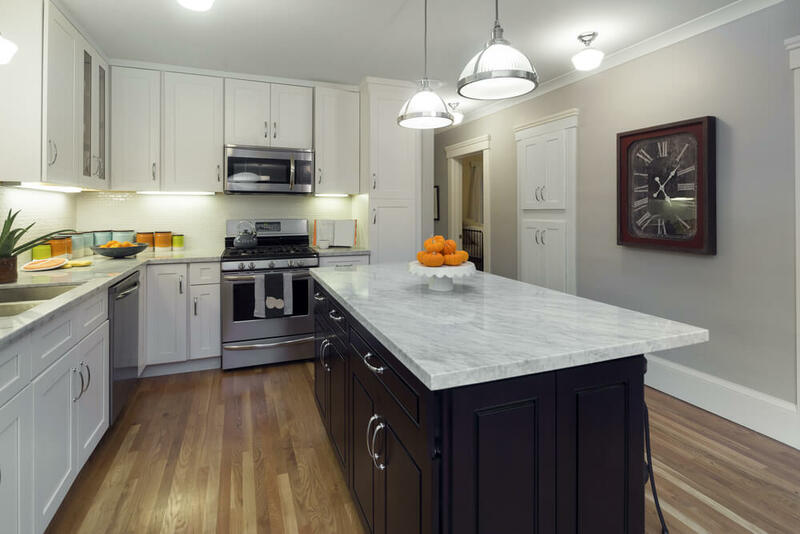 The black cabinetry pulls out the deep gray tones in the Carrara marble countertop. 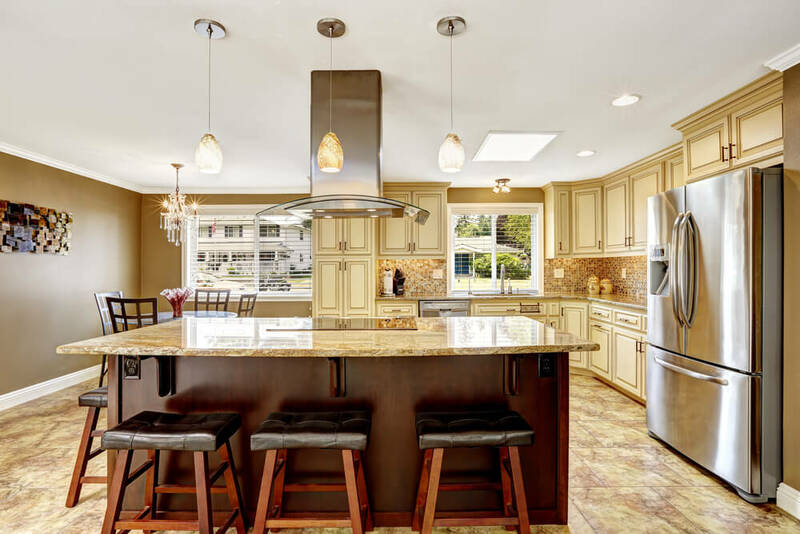 This spacious island is designed to seat five at the breakfast bar area. In addition, it is designed with decorative legs and paneled surround to coordinate with the kitchen cabinetry. This dark wood island features lots of storage space, decorative feet and a bi-level construction that accommodates a breakfast bar. 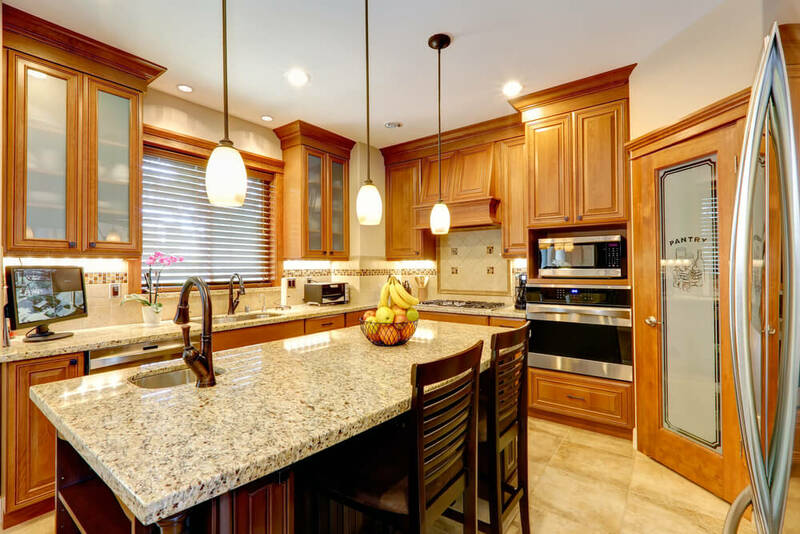 The granite countertop is the same that covers the remainder of the kitchen cabinets. 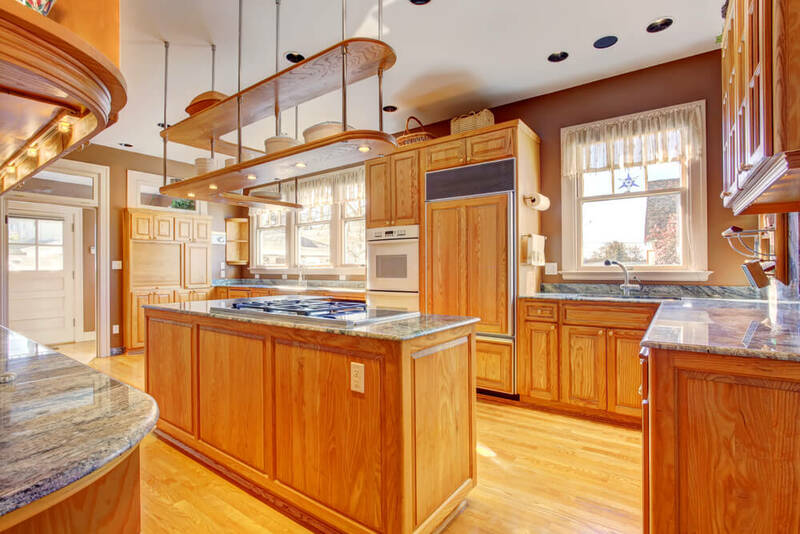 This maple wood kitchen features a large rectangular island with bi-level design. Its seats three comfortably along the breakfast bar and contains additional storage on one end. 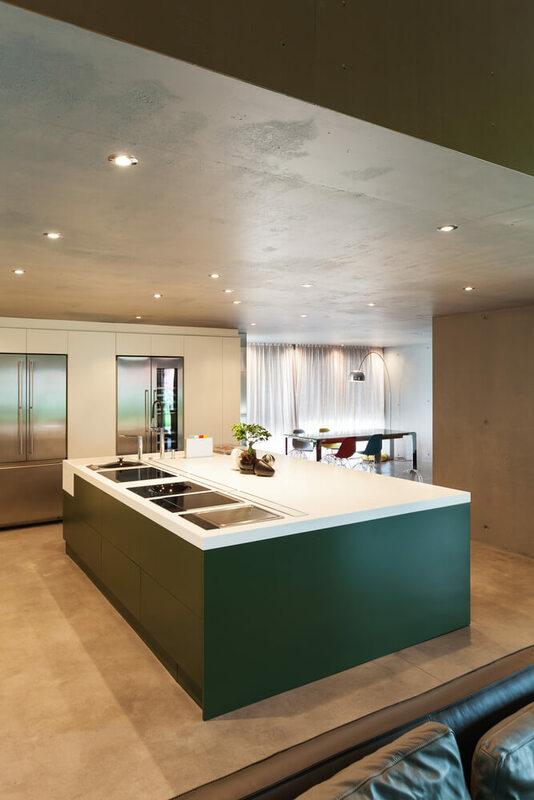 This large space contains two large islands with stainless steel surfaces. One contains the main kitchen sink while the other provides ample space to display food for family get-togethers and dinner parties. This island manages to incorporate a gas cooktop and small, undermount sink while also providing space to sit and eat. 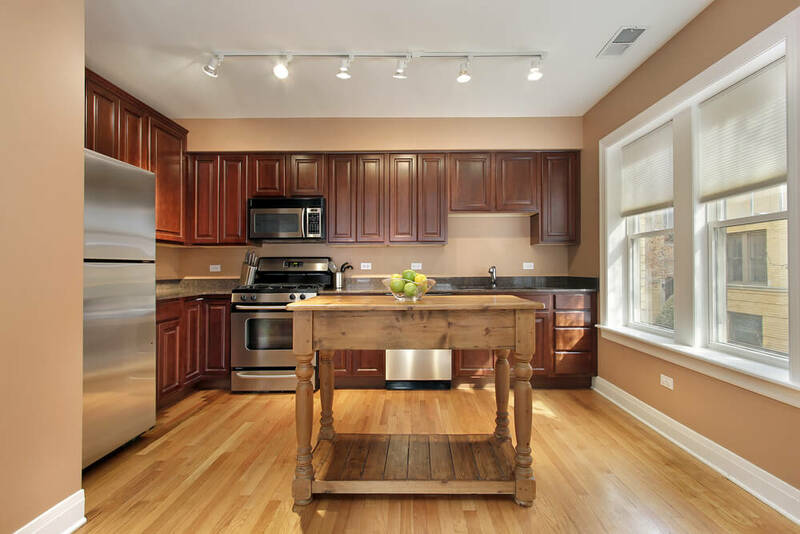 The dark wood of the cabinetry coordinates with the pantry door and subway tile backsplash. 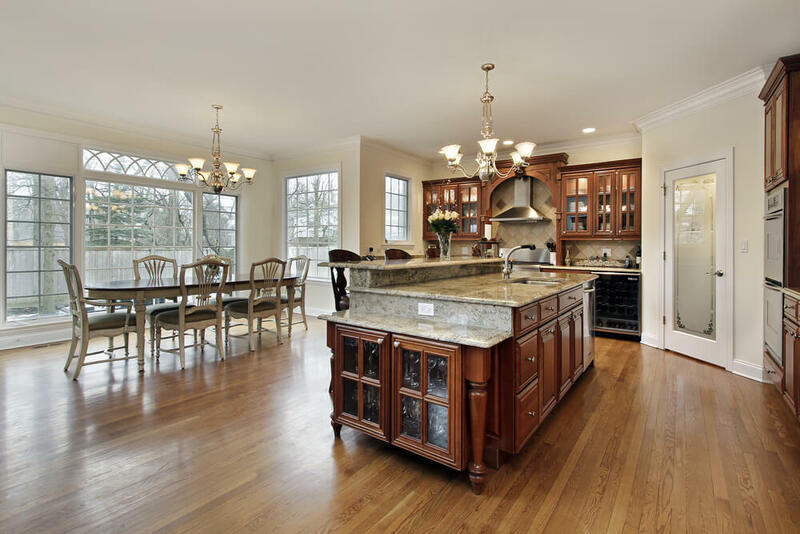 This traditional kitchen has plenty of space to accommodate and island and attached dining area. The island features a sink and lots of storage space while the dining table provides an area for intimate, family meals. 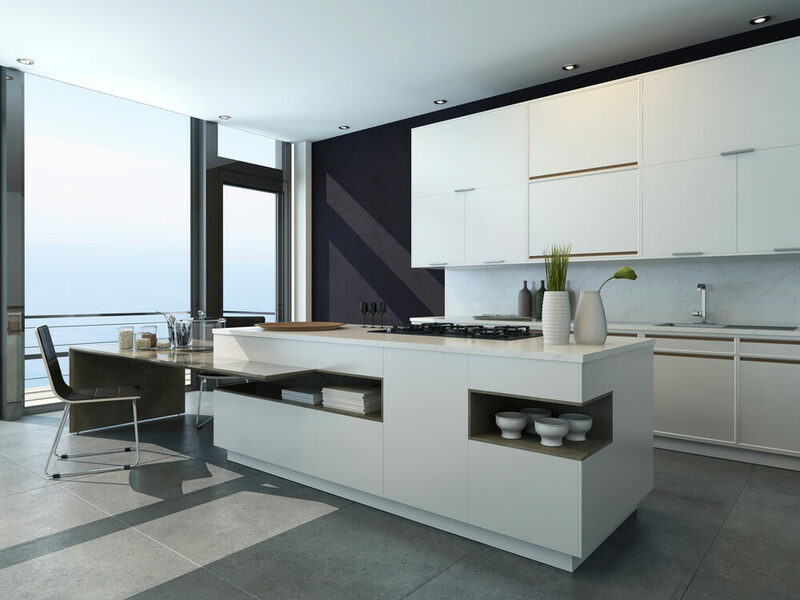 This island is designed to resemble a piece of furniture rather than kitchen cabinetry. The application of furniture feet elevate it slightly off the floor. This island features tall furniture feet that raise it significantly off the floor. This creates the illusion of a more spacious kitchen and provides a unique feature to this dramatic island. This island features a long, uninterrupted stretch of countertop, ideal for daily kitchen tasks, even paying the bills and doing homework. The cabinetry at the end provides additional storage and a space for baskets. 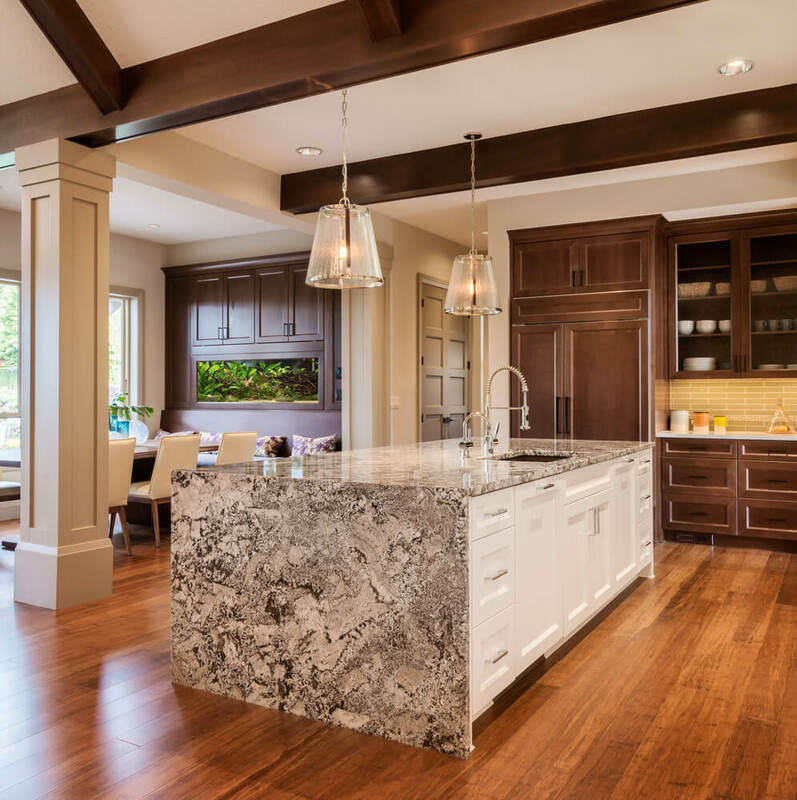 This unique island features a solid, stone table that is separated from the rest of the island cabinetry by another large slab of stone. This unusual design provides an eat-in area for the kitchen, as well as space for food prep. This rectangular island is designed using the same materials surrounding the kitchen cooktop. 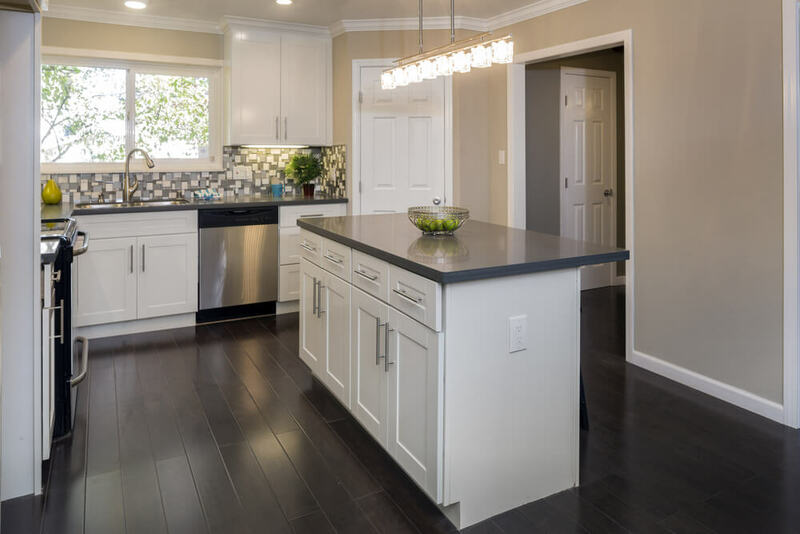 The Shaker-style cabinetry and granite countertops provide a simple, contemporary aesthetic. A breakfast bar with space for two is located at the far end of this island. The remainder of the space is available for various kitchen functions. By incorporating a piece of furniture, this small kitchen is able to accommodate an island that provides access to additional counterspace and a place to eat. Curved furniture feet create separation between the dark wood flooring and the rectangular island. Space is made available for bar stools, as well as a sink for kitchen clean up. This rectangular island is designed to include drawers for functional storage. The black countertop matches that which is used throughout the kitchen. 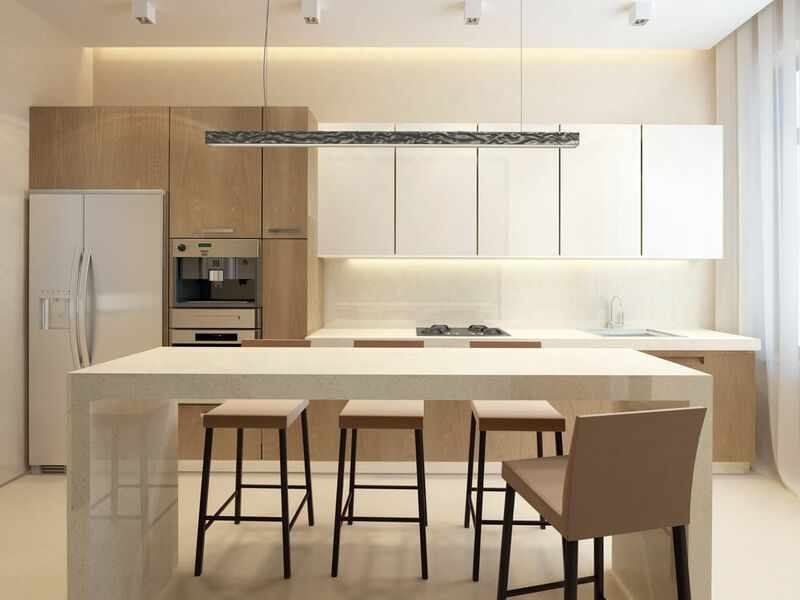 This sleek, modern kitchen features an island that is one solid stone surface. 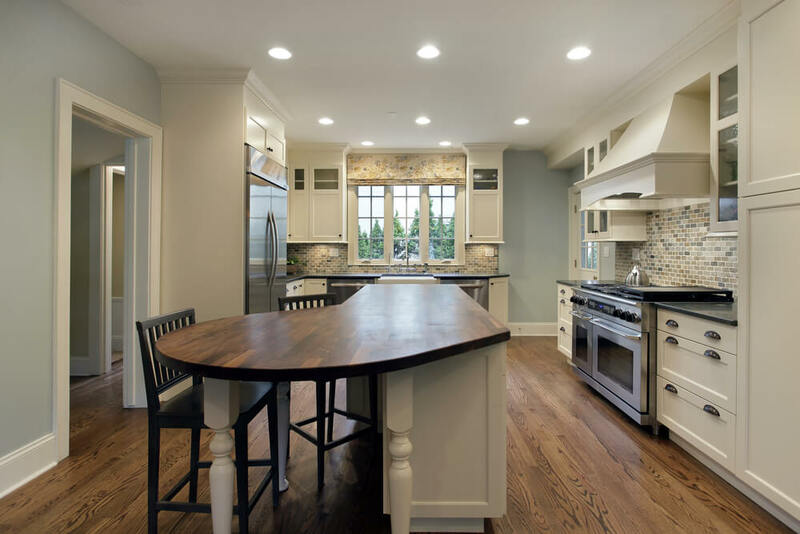 By omitting cabinetry it provides space for seating on both sides of the island. This island is painted a deep gray/blue that provides a dramatic contrast from the creamy, white cabinets. Open shelving creates space for cookbooks and decorative accents. 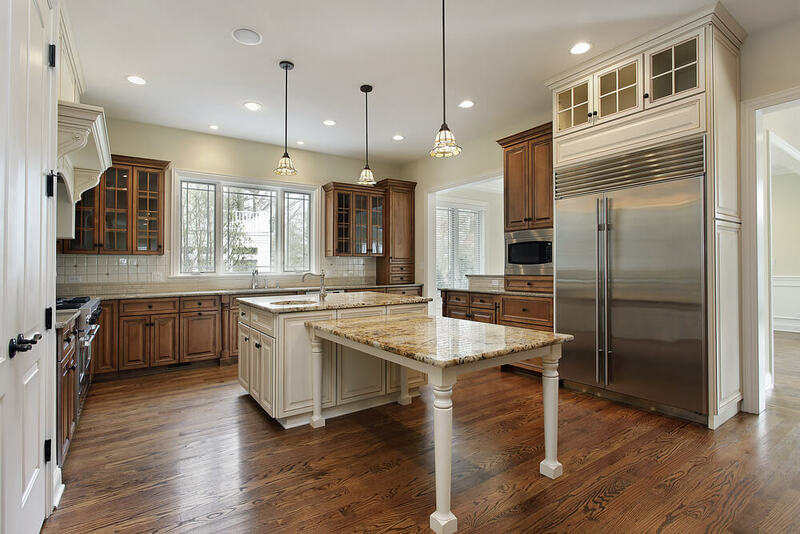 This traditional kitchen features and island with decorative wood legs, glass-front cabinetry and a bi-level design. It is designed to appear as an elegant furniture piece, rather than simple cabinetry. The benefits of this small island is that it provides additional counterspace but can also be arranged in a different location when needed. 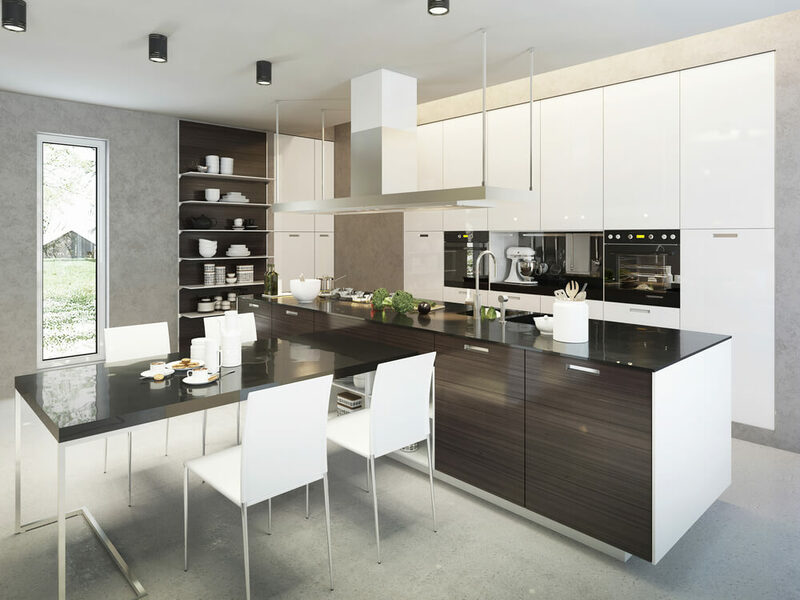 This sleek, modern island features contrasting black and wood details. The extended countertop provides space for seating on all sides, rather than one. This island has the appearance of a piece of furniture with two columns of drawers flanking the seating area, as well as an additional drawered unit located at the end of the island. 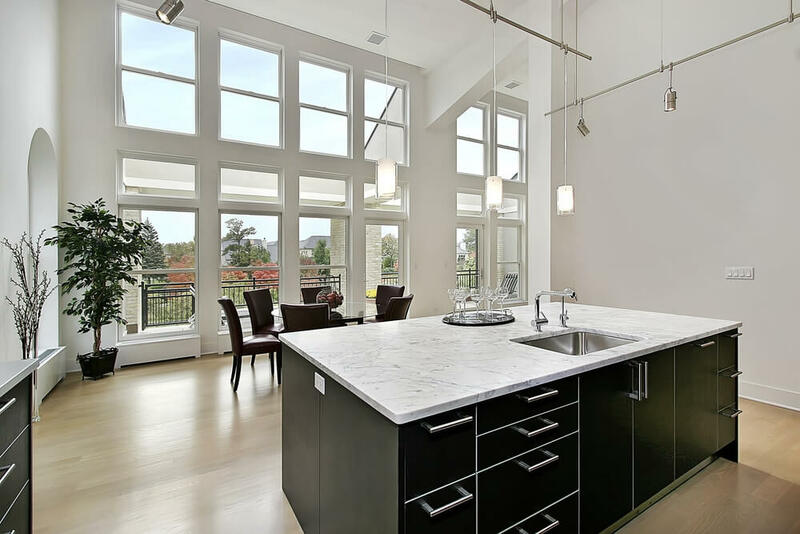 Its glossy countertop reflects the natural light streaming in from the large adjacent patio doors. 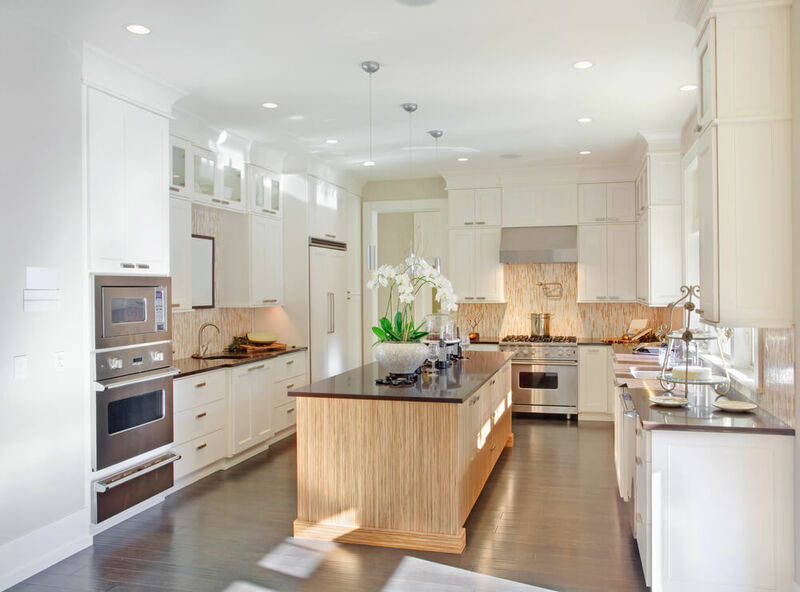 This expansive island contributes to the modern design of this kitchen. 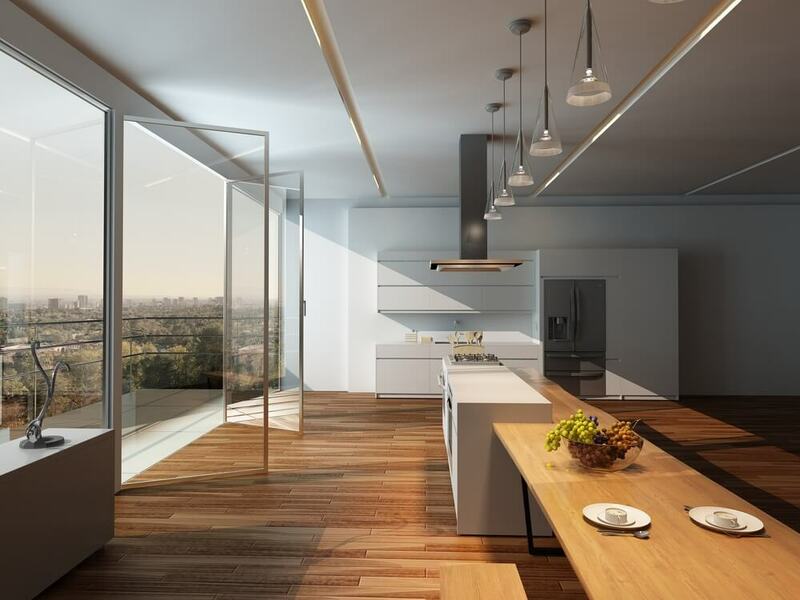 It features a large, horizontal surface and additional horizontal lines framing the cabinetry below. It allows space for a sink, cooktop and seating area. 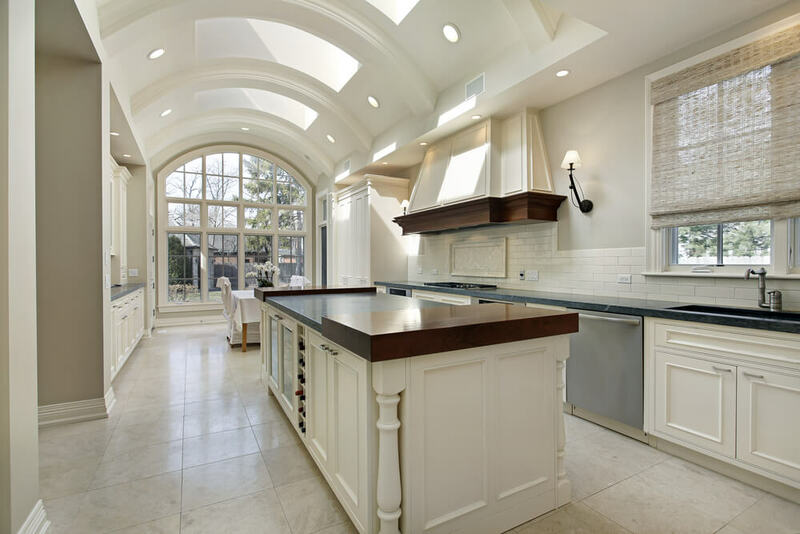 The curvature of this island reflects the design of the stonework surrounding the cooktop. Its rustic detailing creates a casual design aesthetic in this impressive space. 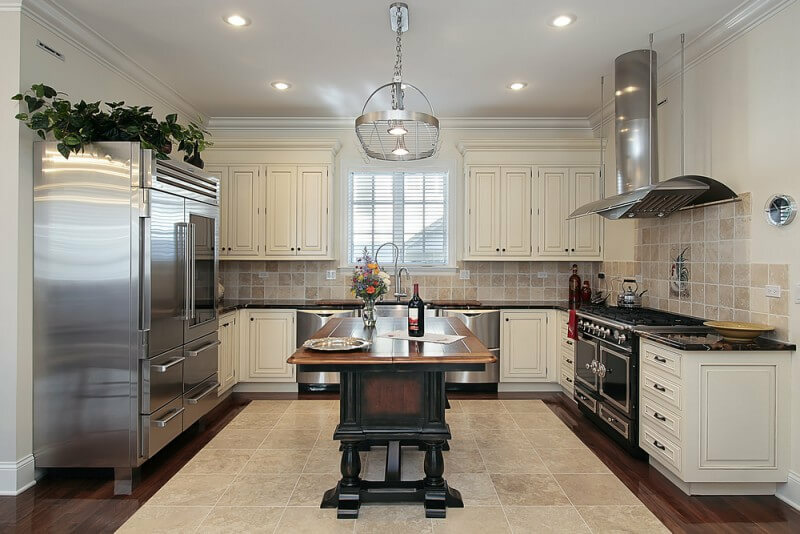 This island features glass front cabinetry, ornamental furniture legs and an integrated wine rack. The wood pieces, located on either side of the island, add a unique detail that accents the work area located between. 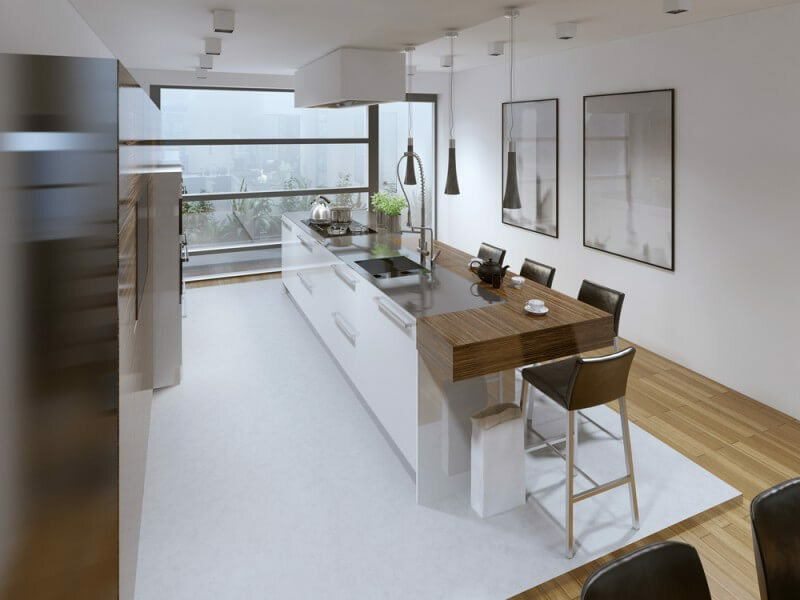 This modern, penthouse kitchen features an impressive island that spans that length of the space. The raised portion provides the space for various kitchen appliances will the wooden area is ideal for hosting a large dinner party. This sleek island features a marble countertop and storage niches ideal for placing dinnerware and cookbooks. A attached dining area is located at the end of the island and provides a gorgeous view of the outdoors. 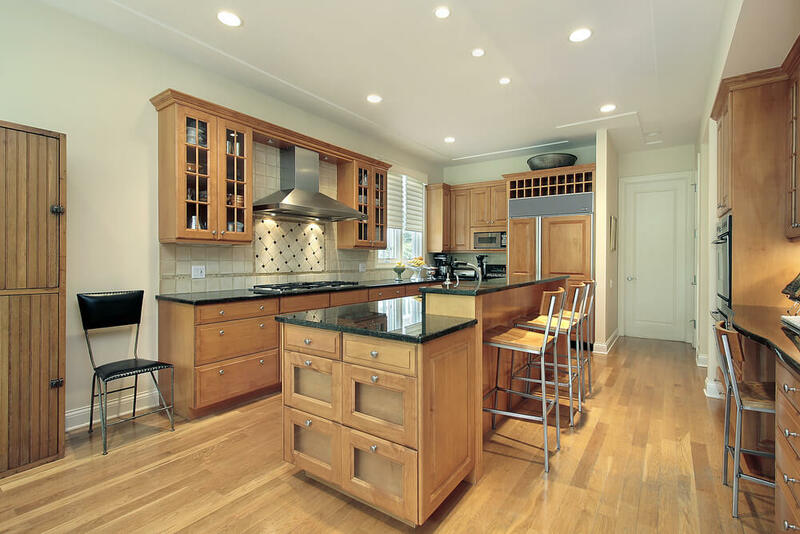 This traditional kitchen contains an island with granite countertops and an undermount sink. A space in the lower cabinetry provides room for two matching bar stools. 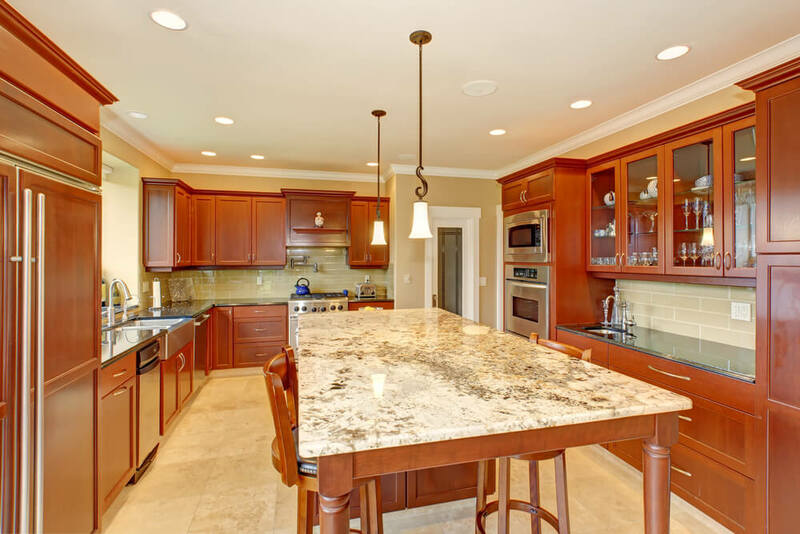 This ornate island features a richly-colored, granite countertop with traditional ogee edge. The decorative accents and corbels provide a French-country design aesthetic. 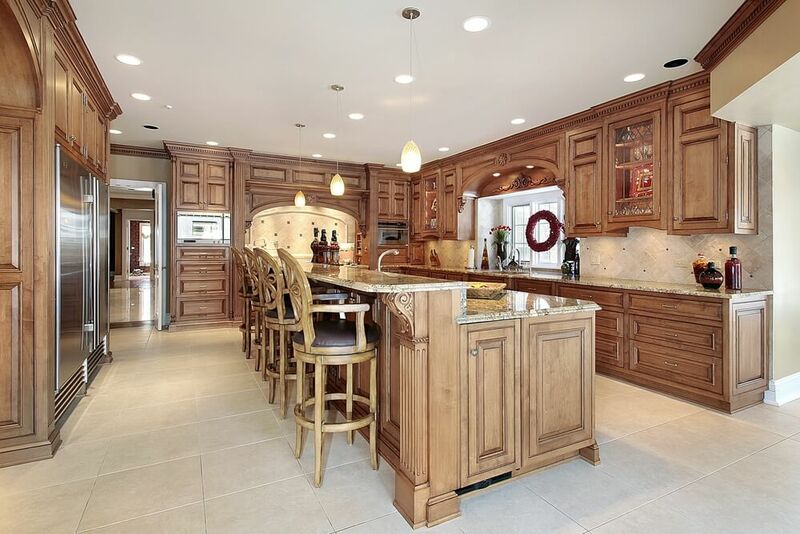 This warm wood island features recessed panels, a wine rack and bi-level design to accommodate a set of bar stools. A trio of pendant lights provide an additional light source for activities at the island. 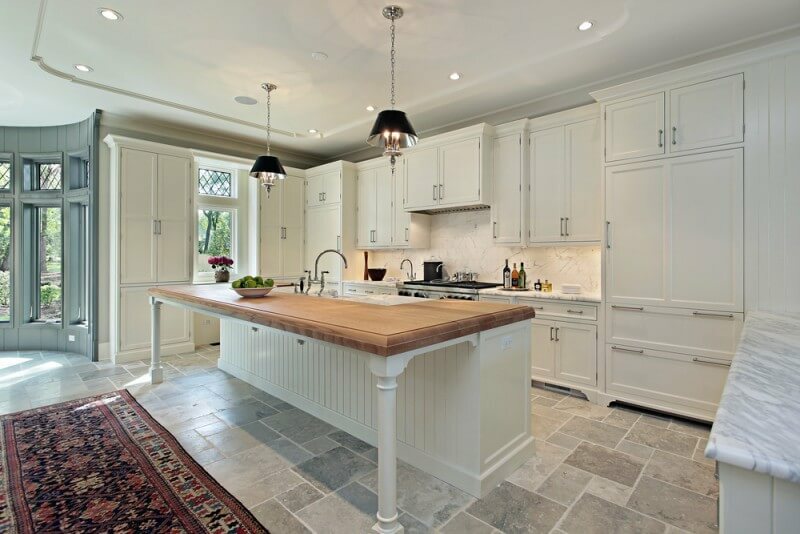 This island is designed with traditional, raised-panel, oak cabinetry. 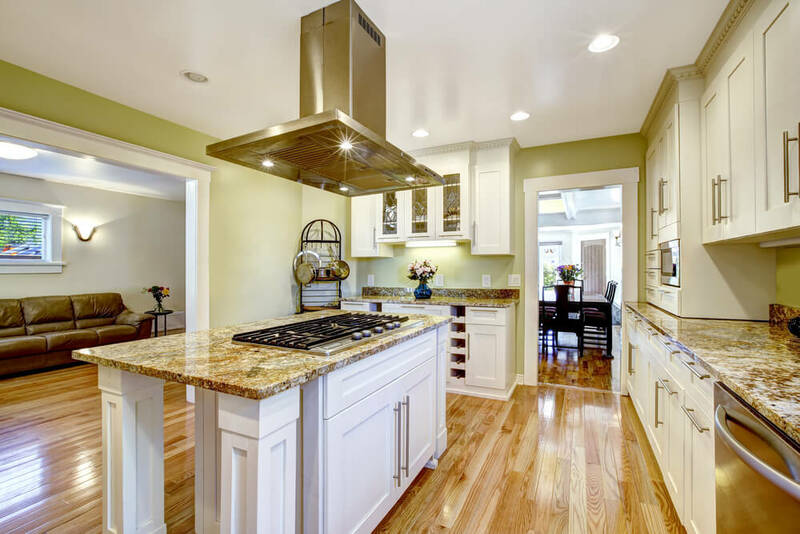 While it may not be large, it does provide space for a cooktop which provides open countertop space elsewhere. 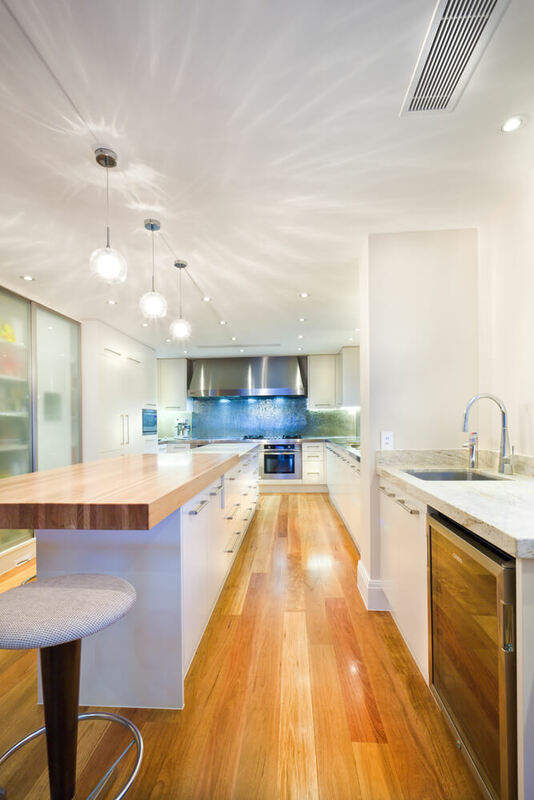 This island incorporates a combination of butcher block, stainless steel and wood surfaces. The large slab of butcher block is designed to accommodate 5+ people. This efficient island is wrapped in a solid stone surface and features a small, undermount sink. It even has enough room to fit matching bar stools for seating. 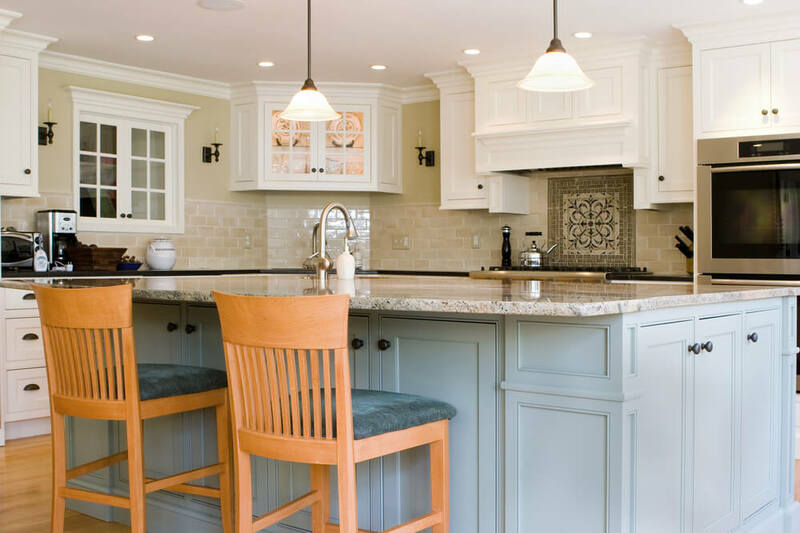 This island is based on the Shaker-style cabinetry of the surrounding kitchen. 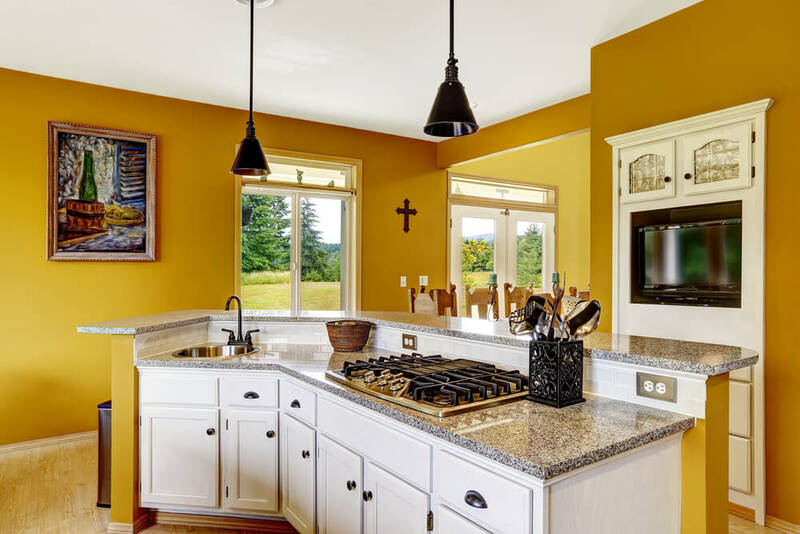 Its countertop features a warm palette of gold, brown and cream. 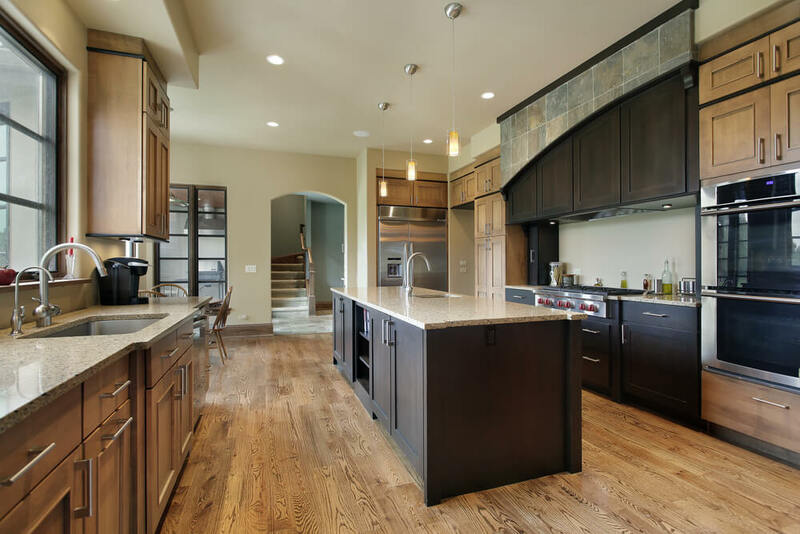 This island features a sleek, range/cooktop that is flanked by additional cabinetry. 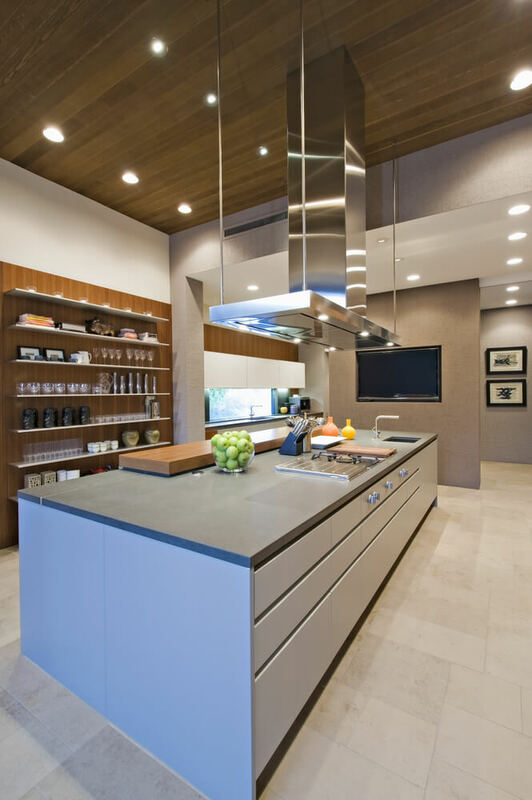 A stainless steel range hood provides ventilation while not overwhelming the space. The countertop extension allow for seating of up to 5 people. This island is angled to suit the layout of the kitchen. It contains a cooktop and small sink for cleanup. The raised surface serves as a breakfast bar. This island is designed to be sleek and simple. It features a large, stone countertop that provides ample space for people to visit and eat. This large island is uniquely designed to seamlessly accommodate multiple kitchen appliances. It dark green color and contrasting white countertop provide a striking focal point for this industrial space. This island’s surface is not one single piece of stone but square, tile pieces installed in a linear fashion. This technique provides luxury of a stone surface while remaining far more cost effective. 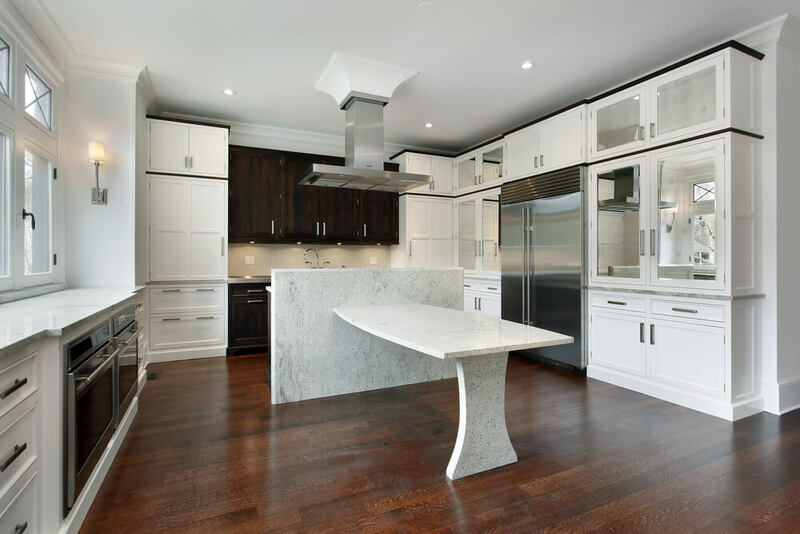 This contemporary kitchen features solid marble countertops. 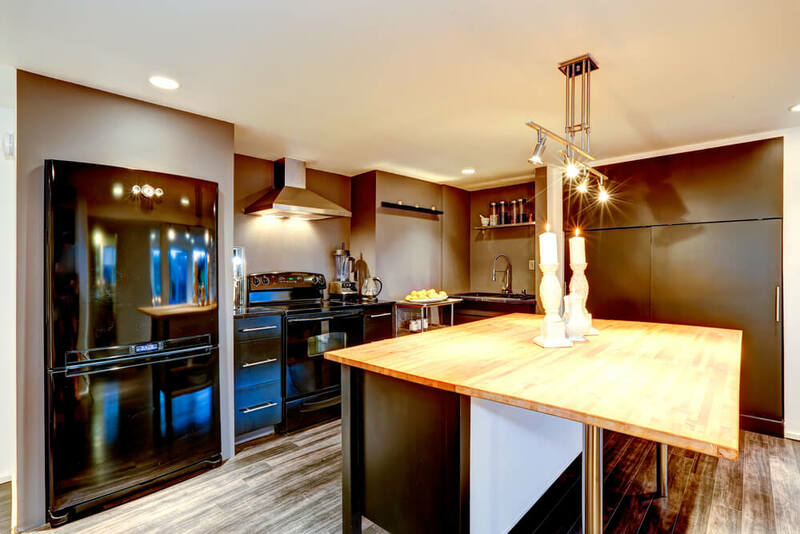 The island is designed to contrast by incorporating dark cabinetry. It features an overhang to provide space for seating. This island is designed to take up minimal square footage by incorporating storage on only one side. This reduces the width of the island while still allowing for space for seating. 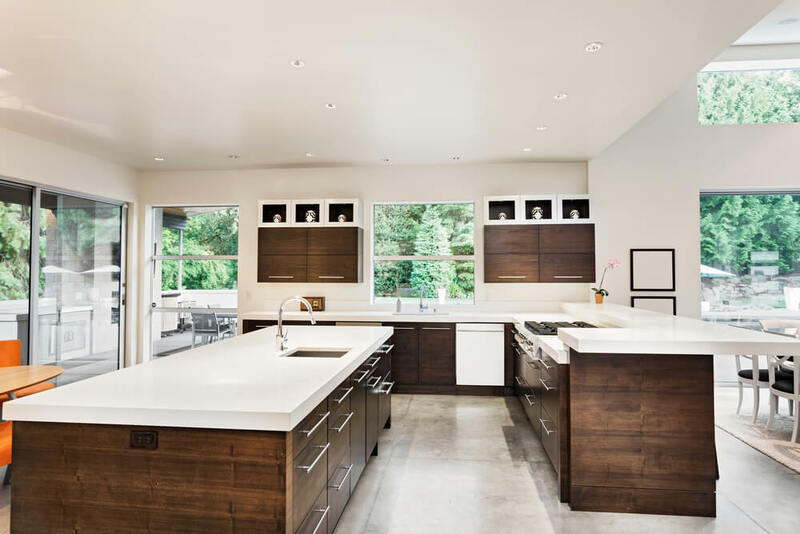 This sleek, modern island features a large space for food prep and clean up. Attached is a peninsula that serves as a dining table for the space. 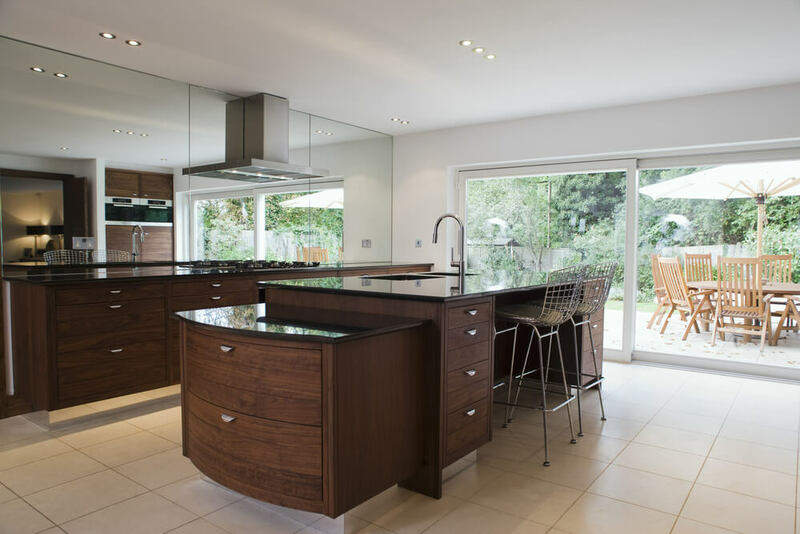 This island has an l-shaped design which provides additional counterspace and easy traffic flow throughout. The wraparound stone countertop adds a crisp, clean element to this kitchen. This island features a countertop that is installed with a waterfall application. This involves a continuous run of the countertop material along the sides of the island as well. This island features a solid surface, a breakfast bar and integrated dishwasher. The industrial pendant lights provide additional task lighting for activities at the island. This island features a unique, curved extension that provides space for three to dine. 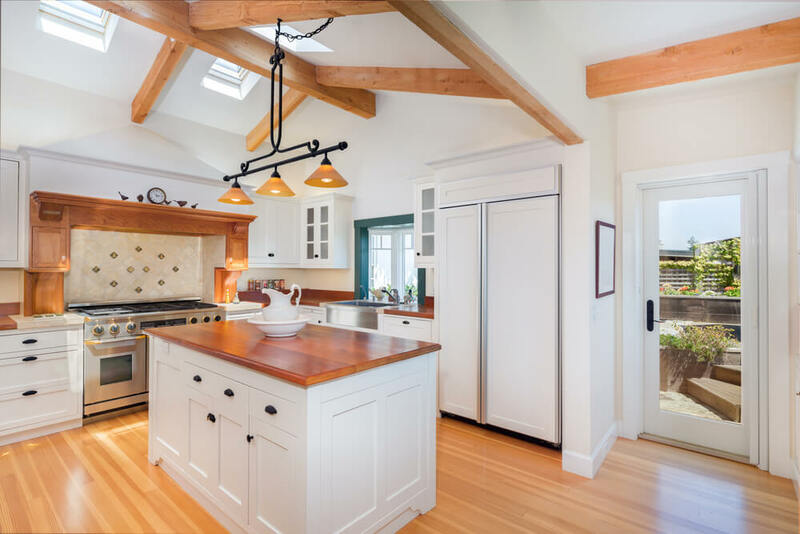 The wooden countertop adds depth and color to the island, anchoring it in the space. This island provides additional personality to this kitchen. It rustic design also coordinates perfectly with this vintage range. 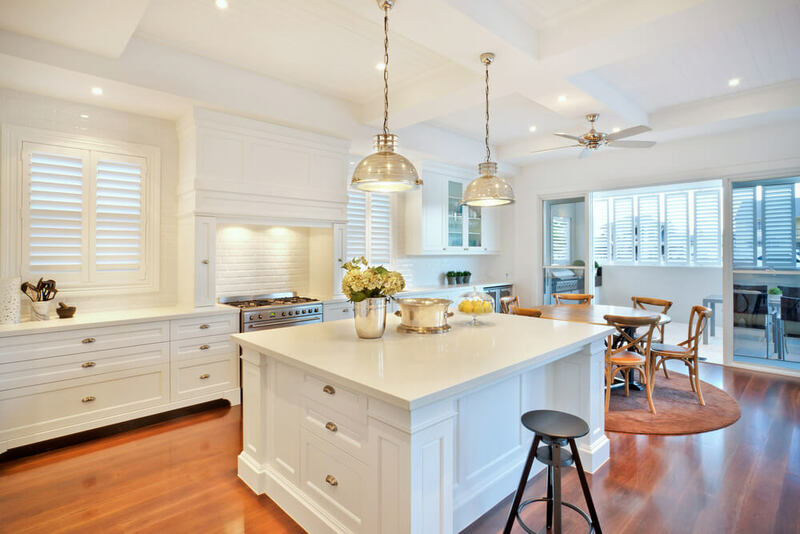 This all-white island features decorative molding and a beautiful marble countertop. The breakfast bar provides comfortable seating for three. 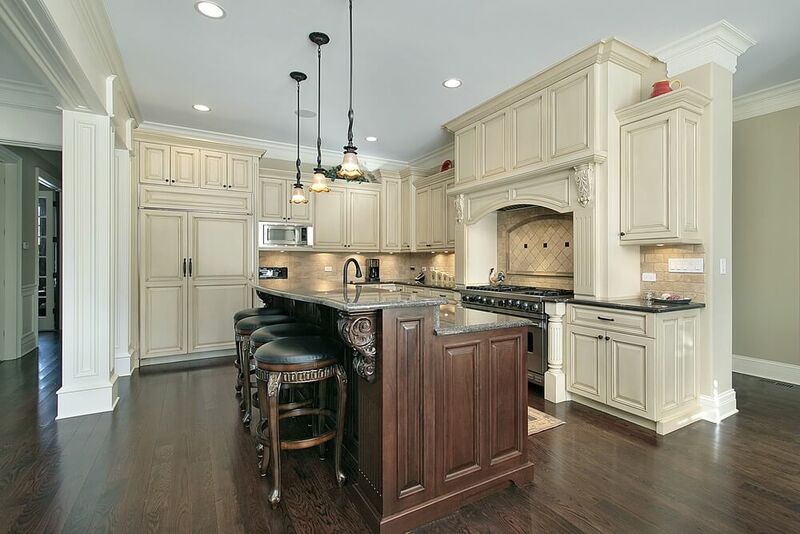 This island features lots of beautiful, custom woodwork and a creamy, stone countertop. 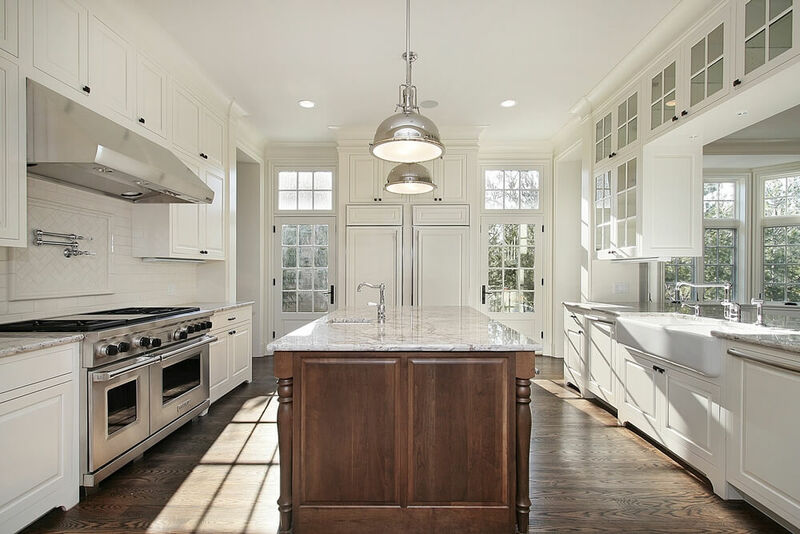 This wood surface of this island adds warmth to this crisp, white kitchen. The eating area provides space for a family of four to eat together.